The largehead hairtail (locally know as "corbata") is globally distributed in tropical and temperate waters except the central Pacific; the eastern Atlantic population reported as this species is probably an undescribed species though. It is very common and locally abundant throughout its range (Collete et al. 2015) . The stock structure of Trichiurus lepturus in the Eastern Pacific is not know, and no assessment of this species has been recently performed by the National Fisheries Institute (INP) of Ecuador. Therefore an unascertained top node is assigned with a management unit for Ecuador, where in the last years represented one of the main species of the fishery for small pelagics being mostly used for reduction purposes (González et al. 2008) . Catches are above the long-term average and reached record high values in 2016. Investigate stock structure of largehead hairtail off Ecuador and conduct stock assessment in order to know the stock status. Improve official catch records and specifically provide catch data for largehead hairtail separately and not as part of a group of species. The National Institute of Fisheries of Ecuador (INP) is responsible for assessing the status of the stock of all small pelagic fishes in Ecuador. However, stock assessment of largehead hairtail in Ecuador has not been conducted, and reference points have not been set. There are not official reports or estimations on the past or current status of largehead hairtail in Ecuador. Catches in 2016 reached 57,464 tonnes, the highest value of the series. The Law of Fisheries and Fisheries Development (Gobierno de Ecuador 1974) is the Law that regulates fishing activities in Ecuador. Management of the Fishery for Small Pelagics in Ecuador (including largehead hairtail) occurring in Ecuadorian national waters is conducted by the Subsecretary of Fishery Resources which belongs to the Ministry of Aquaculture and Fisheries. A new Law of Fisheries and Aquaculture is in draft stage (July 2018). When this Law is approved, the Fishing Authority will be entity responsible for management of Ecuadorian fisheries and aquaculture activities. Largehead hairtail in Ecuador is not managed through TACs or catch quotas and reference points for this resource have not been set. Management authorities have adopted some, but not all, of the technical measures proposed by the INP in the last years. Minimum landing sizes have not been set ignoring the high rates of juveniles in the catches repeatedly reported by INP (González 2010) (González et al. 2008) (Prado España 2009) . Management of largehead hairtail in Ecuador consist of temporal closures (two months; in 2018 the closed season was set from 1-31 March and from 24 October-23 November) (MAP 2018) , spatial closures (fishing is not allowed within the first mile from the shoreline (MAP 2003) (MAP 2007) ; first eight miles from coast are reserved for artisanal fisheries; (MAP 1990) ) and a minimum mesh size of 1,5 inches for purse seiners targeting largehead hairtail and other small pelagic species in Ecuador (MAGAP 2011) . Bycatch by purse seiners targeting small pelagic species in Ecuador cannot exceed 20% (MAGAP 2011) . The use of fishing lights has been prohibited in 2011 (MAGAP 2011) . A fisheries observer program is in place covering at least 30% of the fishing trips (MAGAP 2010). There are no TAC or quotas set for the largehead hairtail fishery in Ecuador. Fishing activities in Ecuadorian national waters are regulated by the Law of Fisheries and Fisheries Development (Gobierno de Ecuador 1974) , which set the penalties for violations of the regulations and acts included in that Law and which includes economic fines, withdrawal of fishing permits or imprisonment. Compliance with regulations is enforced through inspections at harbors and observers on board of commercial vessels. The new Law of Fisheries and Aquaculture which is in draft stage (July 2018) will set the new legal framework for compliance and enforcement in Ecuadorian fisheries, including a wide array of penalties such as withdrawal of fishing license, confiscation of fishing products, economic fines and immobilization of the vessel. This new Law also specifies that compliance will be enforced through VMS monitoring, on-board observers, inspection of landings, image recording systems among others. There magnitude of IUU fishing in the fishery for small pelagic species in Ecuador is unknown. There is no information on the degree of compliance and enforcement of the existing regulation measures. There is very little information on the interaction between Ecuadorian purse seiners targeting small pelagic species and sharks, although it has been reported that some bycatch of small sharks and rays can occur (Coello 2005). The National Plan for Sharks (Aguilar et al. 2005) is being implemented as a way to improve the conservation of sharks and rays and reduce the accidental catch of these species by industrial and artisanal fishing boats. The Fishery for Small Pelagics in Ecuador is a multispecific fishery. A change in the main technical specifications of the fishing gears occurred after 2010 (e.g. increase of mesh size) by means of several regulations (MAGAP 2010) (MAGAP 2011) , giving rise to a shift in the catch composition and main target species. Main species in terms of landed biomass for the period 2012-2016 were: Scomber japonicus (chub mackerel, “macarela”), Decapterus macrosoma (shortfin scad, “picudillo”), Trichiurus lepturus (Largehead hairtail, “corbata”), Auxis thazard (frigate tuna, “botella”), Cetengraulis mysticetus (Pacific Anchoveta, “chuhueco”), Fistularia commersoni (bluespotted cornetfish, “trompeta”), Prionotus spp. 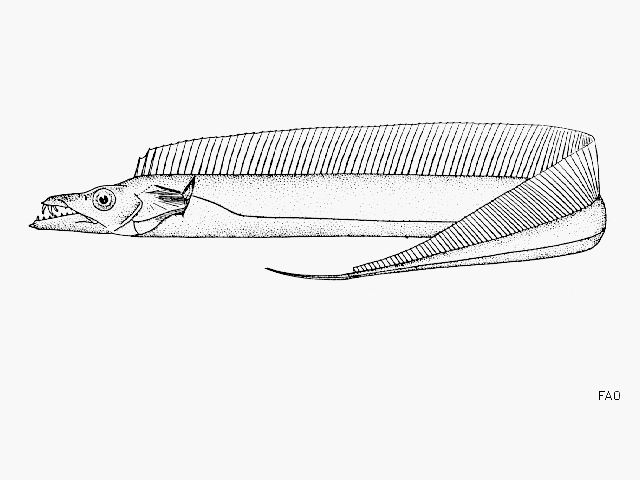 (searobins, “gallineta”), Ophistonema spp. (thread herring, “pinchagua”) and Etrumeus acuminatus (red-eye round herring, “sardina redonda”). The pelagic ecosystem in the Eastern Tropical Pacific Ocean has been object of research and it is well described. Models have been developed in the past to describe the ecosystem dynamics, structure and functioning in relation to tuna fisheries (Olson and Watters 2003) . However there is no enough data to understand if the fishery for small pelagic fish (and especially the harvesting of largehead hairtail) may cause serious or irreversible harm to the whole ecosystem as the specific impact of this fishery was not assessed in the model. Largehead hairtail is not managed through TACs or fish quotas in Ecuador. Some but not all the management recommendations made by the National Institue of Fisheries of Ecuador (INP) have been adopted by the management entity. For instance, there is a two-months ban established every year to protect the reproduction of the species, a regulation on mesh size and some spatial protection measures have been adopted to protect reproductive phases, as advised. Minimum landing sizes, however, have not been implemented in spite of being one of the recommendations of the INP. Landings of largehead hairtail have notably increased in the last years likely due to a change in gear regulation after 2010-2011, and they are the above average level in the time series but there is no information on current stock status because stock assessment has not been recently conducted. Although harvest levels have not been recognized as unsustainable, stock assessment of largehead hairtail in this region has never been conducted so it is not possible to know if current harvest levels are sustainable and what will be the stock health in the future.